Recently, in the midst of what can only be described as one of the worst stretches of economic road in the history of the United States, more room availability was added to the Stowe lodging market. This is a tribute either to the unflappable optimism of people who think that offering lodging is a good way to make money, or the resilience of the Stowe market. I think it's a little of both. I've always been uncomfortable applying the business model to something like innkeeping. The best inns I've seen aren't the ones who have bullet-proof marketing plans and more debt than Romania and Belarus combined. The best inns are run by people who just like to meet lots of different folks, and who like to live in a nice place, and who aren't worried sick about squeezing a decent online review from the last Connecticut license plate to pull out of the driveway. We Americans love to apply the business model to everything. I remember when I bought my first pickup truck, a friend's mother said, "Hey, you can make some money with a pickup truck." Ever the emotional artist, I looked at her with bemused confusion; I'd just always wanted to own a pickup truck. 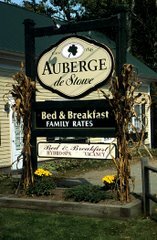 So when my wife and I bought a B&B in Stowe, we weren't interested in racing to the top of the list of inns in Stowe. We just wanted to live in a nice place and raise our kids and meet some interesting folks. That's not to say that people who approach innkeeping as a business are daft. I have to run my inn like a legitimate business or I'd be out of business. I enjoy watching and learning from the more aggressive and savvy business-focused innkeepers of the world. Am I worried about them putting me out of business? No, because they can't offer the one thing that makes our inn unique: us. That "us" factor is the key to this business, and no amount of gushing online reviews or legions of Facebook "fans" can do for your business what that does. Or so it's been my experience. And as for more rooms coming into play during a tough economic stretch? Why not? Everybody's got their own notion of innkeeping.